"Iowa State University Cyclone Football 'Varsity' Marching Band"
The Iowa State Cyclones football is the football team at Iowa State University in Ames, Iowa. The team is coached by Matt Campbell. The Cyclones compete in the Big 12 Conference, and are currently a Division I Football Bowl Subdivision (FBS) member of the NCAA. The Cyclones play their home games at Jack Trice Stadium, with a capacity of 61,500. Football first made its way onto the Iowa State campus in 1878 as a recreational sport, but it wasn't until 1892 that an organized group of athletes first represented Iowa State in football. In 1894, college president William M. Beardshear spearheaded the foundation of an athletic association to officially sanction Iowa State football teams. The 1894 team finished with a 6–1 mark, including a 16–8 victory over what is now the University of Iowa. One of the pioneers of football, Pop Warner, spent time at Iowa State early in his career. In 1895 despite already being the coach at Georgia he was offered $25 per week to come to Iowa State, who's season started in mid-August while Georgia's started a month later, as well as provide weekly advice during the rest of the season. Soon after Warner left for Georgia, Iowa State had its first game of the season. Iowa State came into Evanston as the underdog Iowa State then defeated Northwestern 36–0. A Chicago sportswriter called the team "cornfed giants from Iowa" while the Chicago Tribune's headline read, "Struck by a Cyclone". Since then, Iowa State teams have been known as the Cyclones. Overall, the team had three wins and three losses and, like Georgia, Iowa State retained Warner for the next season. In 1896 the team had eight wins and two losses. Despite leaving Cornell in 1898, Warner remained as the head coach of Iowa State for another year. During his last three years at Iowa State the team had a winning season but Warner was unable to match his 1896 triumph. After playing at Iowa and then serving as an assistant coach for two years, Clyde Williams came to Ames as an assistant coach for ISU. Williams served as the Cyclones' head football coach for six seasons from 1907 to 1912. During that time, he had a coaching record of 32–15–2. This ranks him fifth at Iowa State in total wins and fourth at Iowa State in winning percentage. In addition, he led Iowa State to two Missouri Valley Conference football titles in 1911 and 1912, which are currently the only two conference football championships in school history. In addition to his football contributions Williams was the school's first men's basketball coach from 1908 to 1911, where he compiled a 20–29 record. He also served as Iowa State's baseball coach, and was their athletic director from 1914 to 1919. In 1914 Iowa State completed construction of their new football field and it was named Clyde Williams Field in honor of the former coach. Williams was inducted into the State of Iowa Hall of Fame in 1956. He is also one of the few people inducted into both the University of Iowa Athletics Hall of Fame (inducted 1993) and the Iowa State athletics Hall of Fame (inducted 1997). The success Iowa State found in the inception of their football program was not replicated for most of the mid-20th century. In 1922 after having two different head coaches in as many years, ISU hired up-and-comer Sam Willaman away from East Technical HS in Cleveland, OH. When Willaman came to Iowa state, he brought with him six of his former East Tech players, including an African-American , Jack Trice. Trice was the first African-American player at Iowa State, and one of the first to play football in the mid-west. Trice suffered a severe malicious injury during a game at the Minnesota in 1923, and died from complications. In 1997, Iowa State's Cyclone Stadium was renamed Jack Trice Stadium in his honor. In his first season, Willaman's team finished with a 2–6 record, but posted a winning record in each of the three years that followed. His career coaching record at Iowa state was 14–15–3. This ranks him 16th in total wins and 13th in winning percentage in Iowa State football history. 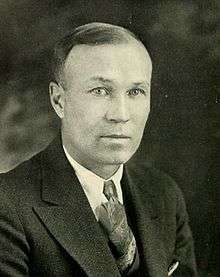 In February 1931, George F. Veenker accepted an offer to become the head football coach for Iowa State. Under Veenker Iowa State experienced a brief period of success. 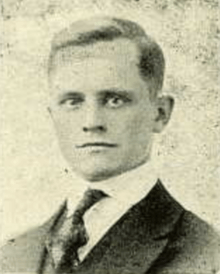 When Veenker joined Iowa State, the school's football team was coming off a winless season in 1930 and had lost 16 consecutive games dating back to October 1929. In his first year, the 1931 team defeated Missouri 20–0, Oklahoma 13–12, and Kansas State 7–6, compiled a 5–3 record and finished in second place in the Big Six. In November 1931, the Ames Daily Tribune-Times called Veenker "a veritable miracle man of football" for taking a school where "Cyclone football morale couldn't have been lower" and turning the program around in his first season. The highlight of Veenker's career as Iowa State's football coach was a 31–6 victory over the Iowa Hawkeyes in 1934. The game was the last meeting between the two schools until 1977. Veenker resigned in 1936, his overall record was 21-22-8. Shortly after his death in 1959 the university owned golf course was renamed Veenker Memorial Golf Course in his honor. During the 1938 season, James J. Yeager was in his second year as head coach. Despite going 3-6 in 1937, the Cyclones would go onto a then-best record of 7-1-1. The team was led outstanding senior guard, Ed Bock. At the conclusion of the season Bock became the first consensus first team All-American in ISU history. Bock was inducted into the College Football Hall of Fame in 1970. In 1942, Iowa State hired former Green Bay Packers All-Pro guard and three time NFL champion Mike Michalske to be the new head coach. Michalske achieved a moderate level of success while at Iowa State, finishing with a 18-18 record after five seasons. In 1968, in an attempt to turn the team around, Iowa State hired former standout Tennessee running back and up-and-comer Arkansas assistant Johnny Majors as the 24th head coach in program history. The rebuilding process got off to a slow start as the Cyclones finished 3-7 in his first two seasons. In 1970 the process started moving forward, the team finish tied for 6th in the Big Eight and had a final record of 5-6. The 1971 team was picked to finish last in the Big Eight, but overcame odds to finish 4-3 in the conference and 8-4 overall. The team was led by junior running back George Amundson, who Majors called "the finest athlete I have coached in any job I have had." Iowa State had one defensive all-conference pick, LB Keith Schroeder. Offensively they were led by Amundson who rushed for 1,260 yards as a running back, including a then school record of 15 touchdowns. End Keith Krepfle had 40 receptions for 570 yards and 12 touchdowns. Quarterback Dean Carlson threw for a then school record of 1,867 yards. These efforts were enough to receive a bid to the 1971 Sun Bowl, this was the first bowl game in program history. Iowa State was slated to play against LSU on December 18, 1971. Iowa State was outmatched by future NFL quarterback Bert Jones, LSU won 33-15. 1972 saw the loss of five starters and the move of George Amundson from running back to quarterback to replace Dean Carlson. The Clones lost linebacker Matt Blair to a pre season injury which forced him into a medical redshirt. The Cyclones tied Nebraska 23-23 on a missed extra point by Iowa State's Tom Goedjen. Three players went on to be named to the first team All-Big Eight team as well be honored as All-Americans, offensive lineman Geary Murdoch, defensive end Merv Krakau and quarterback George Amundson. George Amundson was named Big Eight player of the year over Heisman Trophy winner, Johnny Rodgers. It was in this year that Iowa State became known as D-Tackle U, similar to Penn State's moniker "Linebacker U". Iowa State's 5-6-1 record was enough to earn them an invitation to the 1972 Liberty Bowl against Georgia Tech. Despite outstanding play Iowa State lost 31-30 on a failed late-game George Amundson two-point conversion. At the conclusion of the 1972 season Majors announced he would be leaving Iowa State to take the head coaching job at Pittsburgh. In order to continue the success experienced under Johnny Majors Iowa State hired Earle Bruce out of Tampa. With new found excitement around ISU football, the University broke ground on a new $7.6 million stadium that would eventually become Jack Trice Stadium. Despite future Minnesota Vikings star linebacker Matt Blair being a first team All-American, the Cyclones struggled to a 4-7 finish in Bruce's inaugural 1973 season. Over the next two seasons the Cyclones experienced moderate success but both seasons ended again with 4-7 records. However, Bruce's fourth team blossomed as one of the best teams in school history. In route to their 8-3 final record the Cyclones scored wins against #7 Missouri and #9 Nebraska. Iowa State was ultimately snubbed by the bowls but finished the 1976 season ranked #19 in the AP Poll. Bruce was selected as Big Eight Coach of the Year. Iowa State followed up their strong 1976 campaign with another eight win season in 1977. The Cyclones beat #9 Nebraska for the second time in a row and were ranked as high #16 in the AP Poll at one point during the season. Their 5-2 conference record and 8-4 overall record were good enough for a bid to the 1977 Peach Bowl against North Carolina State. Ultimately Iowa State lost the game 14-24. The Cyclones returned 14 starters from the 1977 Peach Bowl team including Heisman Trophy candidate, Dexter Green and Outland Trophy hopeful, Mike Stensrud. Iowa State's post season hopes came down to their last game against Colorado which was nationally televised. The game was close throughout, with ISU clinging to a 17-10 halftime lead. The second half was a defensive battle, but the ISU defense came up with big plays down the stretch. Mike Stensrud had 16 stops and caused a fumble to help ISU preserve a 20-16 win over the Buffs. The win earned ISU a bid to the 1978 Hall of Fame Classic against Texas A&M. Iowa State opened the game with two touchdowns but was unable to convert for extra points on either attempt. The Cyclones were not able to contain future first round NFL draft pick Curtis Dickey who rushed for 278 yards and a touchdown. Iowa State lost 28-12. At the conclusion of the 1978 season Bruce announced he would be leaving Iowa State to take the head coaching job at Ohio State. In order to continue the success found under Earle Bruce, Iowa State hired Oklahoma assistant Donnie Duncan. He was the 26th head football coach at ISU and he held that position for four seasons, from 1979 until 1982. His 1980 and 1981 Cyclones squads both made appearances in the national rankings. The 1981 Cyclones began the season at 5–1–1 and rose to No. 11 in the AP Poll. Led by future NFL players Dwayne Crutchfield, Dan Johnson, Karl Nelson and Chris Washington, the Cyclones tied #5 Oklahoma 7–7 and downed #8 Missouri 34–13. However the success was short lived, Duncan resigned with a career record of 18-24-2 after the 1982 season. Following the 1982 season Iowa State then hired Jim Criner who had won the 1980 NCAA Division I-AA Football Championship as the head coach at Boise State. During his tenure the Cyclones expirienced mild success however they were embroiled in controversy. Multiple players were arrested on different charges as well as several NCAA allegations of wrongdoings. Allegations included coaches giving players cash as well as giving recruits rides and meals. His rough tenure came to an end Noverber 12, 1986 when the school announced his firing. Criner's final career record at Iowa State was 17-25-2. Jim Walden succeeded Jim Criner at Iowa State, where he compiled a 28–57–3 over eight seasons. ISU had been hit with scholarship reductions by the NCAA, both because of infractions by the previous coach, and an overall reduction in scholarships for Division I-A for the 1988 season. In his first four years as Iowa State's head coach, he had just 57, 61, 63, and 67 scholarship players. Walden had 47 scholarship players on his squad in 1989 that he brought to Lincoln to play Nebraska on October 28, and they lost 17-49. Walden was the last Iowa State coach to defeat Oklahoma, which they did on October 20, 1990. Oklahoma was ranked 16th in the nation at the time. They had narrowly missed an upset the year before, losing in Ames 40-43. His best record with the Cyclones was 6–5 in 1989. After the 1989 season, Walden was offered a head coaching job at the University of Arizona, but he declined the job, citing a number of people at Iowa State telling him it would be "devastating" if he left. In retrospect, Walden said he was "too dumb" to leave. Walden's teams were plagued with injuries, especially at quarterback. In 1991, third-string quarterback Kevin Caldwell started the final five games of the season; he began the season as a tailback. Walden played four quarterbacks in a 41–0 loss to Kansas in 1991. In 1992, Walden installed the triple-option offense and had mixed results. Iowa State lost to in-state rivals Iowa and UNI early in the 1992 season. The loss to UNI was the first loss by Jim Walden to a Division 1AA school. It was also UNI's first victory over the Cyclones since 1900. Iowa State bounced back to shock the seventh ranked Nebraska Cornhuskers at home on November 14, 1992. The victory was even more improbable because Walden was starting his third-string quarterback, Marv Seiler, for the first time. Walden's 1993 squad went 3-8, but with an upset of 18th ranked Kansas State. Walden ended the 1993 campaign with a walk-on quarterback, Jeff St. Clair. "I've kept quiet too long, but since I'm leaving there's nothing they can do about me. I think the refereeing in this league is atrocious. . . What do you do with bad officials? Do they get fired? You fire bad players and bad coaches. Bad officials get a raise and go fishing." Walden coached his final game on November 12 against the Nebraska in Ames. Iowa State had an 0-8-1 record and Nebraska was undefeated, with a #1 ranking. Unbelievably Walden's Cyclones hung with the Huskers. At the end of the third quarter, Nebraska led by only two points, 14-12. The final quarter proved to be too much for Walden's team, and Nebraska won the game 28-12. The Cyclones finished with a winless 0–10–1 record in 1994. Walden ranks sixth at Iowa State in total wins and 22nd winning percentage. To turn the program around Iowa State hired Wisconsin defensive coordinator, Dan McCarney. The lone bright spot that McCarney inherited was sophomore phenom running back Troy Davis. Davis would go on to break nearly every Iowa State rushing and touchdown records, most that still stand. Troy twice earned unanimous All-American honors and was the first NCAA Division I-A running back to rush for over 2,000 yards in back-to-back seasons, a feat that has yet to be repeated. Davis finished 5th and 2nd in Heisman voting in his 1995 and 1996 campaigns respectively. McCarney would go 10-34 in his first four seasons as the Cyclones head coach. In McCarney's sixth season the Cyclones were finally able to put together a competitive team. The 2000 Cyclones were quarterbacked by Sage Rosenfels. Sage is among many former Cyclones from the 2000 team to make it to the NFL. Others were J. J. Moses, Reggie Hayward, Ennis Haywood, Tony Yelk, Mike Banks, Jordan Carstens, Tyson Smith and James Reed. Despite Iowa State being picked by the media to finish 5th in the Big 12 North Division, the Cyclones finished with a 5–3 conference record and a 9–3 overall record. ISU finished the season ranked #25 and their nine wins were a program best since 1906. They were then invited to play in the Insight.com Bowl against Pittsburgh, Iowa State's first appearance in a bowl game since the 1978 Peach Bowl. Iowa State was able to beat the Panthers 37–29, this was the first post-season victory in program history. In an interesting side note, Paul Rhoads was the defensive coordinator for Pittsburgh in this game; he would later become the Iowa State head coach. The 2001 season saw the emergence of JUCO transfer Seneca Wallace and star wide receiver Lane Danielson. The dynamic duo led the Cyclones to a last second win over Iowa, a 7-5 overall record, and an invitation to the Independence Bowl against Alabama, their second consecutive bowl game. The Cyclones just missed a 47-yard field goal attempt with 0:46 remaining in the fourth, which would have given State the lead and potential victory. Subsequent to the game there was some question about whether or not the field goal was actually good, as it sailed directly over one of the uprights. The Cyclones lost 13-14. Seneca Wallace would lead the Cyclones to a 6-1 start in 2002, including a near-win against the Florida State in the Eddie Robinson Classic in Kansas City, Missouri. Wallace dove towards the goal line at the last second but was ruled out shy of the end zone. During the home game versus Texas Tech, Seneca Wallace scored on a 12 yard touchdown by running an estimated 120 yards backwards, forwards, and sideways on the field. Wallace dodged tackles and received numerous blocks from his offense, including one devastating block made by running back Michael Wagner. The play briefly catapulted Wallace into Heisman Trophy contention and was recognized by ESPN as the "Play of the Week." It has since been recognized as one of the great plays in college football history. The play is known among Iowa State fans simply as "The Run." Ultimately their 7-7 record was enough to receive a bid to the Humanitarian Bowl against Boise State where they lost 16-34. The 2004 season would be much more successful than the disappointing 2-10 2003 for the Cyclones. Redshirt freshman Bret Meyer took over the quarterback spot and paired up with fellow redshirt freshman receiver Todd Blythe to make a lethal combination. The season got off to a slow start opening the season with a 2-4 overall record and a 0-3 record in the conference. McCarney turned the season around by winning the next four games in a row. The Cyclones had a chance to win the Big 12 North Title but fell short after a Missouri defender intercepted a pass intended for Jon Davis in the end zone. The Cyclones would go on to play the Miami RedHawks in the 2004 Independence Bowl. In the Independence Bowl, Iowa State prevailed for a 17-13 win as freshman quarterback Bret Meyer rolled up 236 yards of total offense. Both Bret Meyer and Stevie Hicks rushed for over 100 yards, an Independence Bowl first. All-Big 12 cornerback Ellis Hobbs iced the win with a 41 yard interception return in the game’s final minute. The Cyclones held on to win 17-13. The Cyclones continued their success under McCarney in the 2005 season. High points during the season include a blowout win against #8 Iowa and a home victory over #22 Colorado. They missed out yet again on the Big 12 title when they lost in overtime to the Kansas after a missed field goal by Bret Culbertson. They led the game in the 4th quarter but allowed Kansas to come back. They got a berth in the 2005 Houston Bowl, but lost 24–27 to the TCU Horned Frogs. TCU opened the game with back-to-back first quarter rushing touchdowns. The Cyclones responded with two Bret Meyer touchdown passes and by forcing a TCU safety. Late in the fourth quarter the game was tied at 24-24 but the Cyclones ultimately lost yet another bowl game on a fourth quarter field goal. McCarney stepped down as head coach after a 4-8 2006 season. McCarney finished with a 56-85 all-time record. To replace Dan McCarney Iowa State hired Texas defensive coordinator Gene Chizik. Iowa State wore 1977 throwback jerseys for the 2007 game against Iowa and re-introduced gold pants as a standard part of their uniform. It marked the 30th anniversary since the restart of the rivalry as well as the 30th anniversary of the 1977 Iowa State Peach Bowl team. They finished the season 3-9, including a 15-13 win over Iowa, and back-to-back wins against Kansas State and Colorado. All three wins were upsets. In 2008, Iowa State opened with two wins against weaker non-conference foes, before losing their next 10 games to finish the season 2-10. Chizik left the Cyclones after the season to become the head football coach of Auburn. 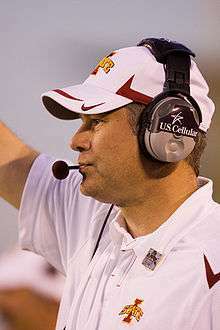 Paul Rhoads was introduced as the 31st head coach of the Iowa State Cyclones on December 20, 2008. Rhoads had previously spent time at Iowa State as an assistant coach in the late nineties and was raised only 20 miles from Ames in Ankeny. His father, Cecil, was one of the winningest coaches in Iowa high school history, coaching for more than three decades and has been inducted into the Iowa High School Football Coaches Hall of Fame. Rhoads' contract was reported to be a 5-year deal worth $5.75 million and included incentives that could increase his salary. To round out his coaching staff Rhoads hired up-and-coming offensive coordinator out of Rice, Tom Herman and veteran defensive coordinator Wally Burnham. Rhoads opened his ISU career with a win over FCS North Dakota State. He then led Iowa State to a victory at Kent State in his first year, ending a 17 game road losing streak. In October 2009 the Cyclones defeated Baylor to end an 11-game losing stretch against conference opponents, and then went on to defeat Nebraska in Lincoln for the first time since 1977. Their 6-6 record was enough to earn them an invitation to the Insight.com Bowl against Minnesota. Rhoads would win his first bowl game at Iowa state 14-13. The lone highlight of the 2010 season was the first ever win at Texas in school history. They upset the #22 ranked Longhorns 28-21. The Cyclones would finish the season 3-5 in the Big 12 and 5-7 overall. In 2011 Iowa State started off the season 3–0 including a triple overtime win over Iowa in Ames, and a win over Connecticut in East Hartford. The Cyclones would drop the next four games, starting out 0–4 in conference play but quickly bounce back. The Cyclones rebounded with a 41-7 win on October 29 at #19 Texas Tech. In the process, Iowa State managed to rack up 512 total yards, the most since the Nov 22, 2008 game at Kansas State. Several other school records were broken, including first-ever win in Lubbock, largest margin of victory against a ranked opponent], and most points scored against a ranked opponent since November 9, 1996. On November 18, Iowa State faced off against undefeated #2 Oklahoma State led by Heisman frontrunner Brandon Weeden and two time Biletnikoff winner Justin Blackmon in Ames. Down 24-7 early in the second half, Iowa State came back with 17 unanswered points to force overtime. In overtime, Iowa State scored on its first play from scrimmage, but Oklahoma State answered back with their own touchdown. In the second overtime, Iowa State forced an interception and ran three Jeff Woody dives in a row to beat Oklahoma State 37-31, smashing Oklahoma State's chances of playing for a national championship and Brandon Weeden's Heisman shot. Iowa State became bowl eligible with the win and improved to 6-4. The win over Oklahoma State marks Iowa State's first ever win against an opponent in the top 6 (AP polls). The Cyclones finished the season 6-6 and would receive an invitation to the Pinstripe Bowl against the Rutgers Scarlet Knights. The Cyclones would lose the game 27-13. The Cyclones opened the 2012 season 3–0 including a 9–6 win at Iowa for the first time in 10 years. The other major highlight of the season was ending TCU's at then-current longest winning streak in college football. They upset the #15 ranked Horned Frogs in Fort Worth 37-23. The 2012 season ended 6–7 and a berth in that year's Liberty Bowl against the Tulsa Golden Hurricane. Iowa State opened the game strong but they ultimately lost 31–17. While things appeared to be promising to move in a positive direction for the Cyclones, Rhoads' future teams were unable to recapture the success of his earlier teams. In his final three seasons, the Cyclones won just four Big 12 games (including a winless conference record in 2014) and went 8-27 overall. The 2015 season proved to be particularly difficult, as in two games, the Cyclones held double-digit halftime leads against both Oklahoma State and Kansas State only to lose late in the fourth quarter. Following a 38-35 loss to Kansas State on November 21, in which he came under heavy criticism for play-calling in the game's final 90 seconds, Rhoads was fired as head coach, effective the conclusion of the season. Matt Campbell, who had been the head coach of the University of Toledo football team, was named head coach at Iowa State on November 29, 2015. Campbell signed a six-year contract worth $2 million his first year. Iowa State has won 2 conference championships in school history. Both Iowa State conference championships were during their membership in the Missouri Valley Intercollegiate Athletic Association (MVIAA), which would later be known as the Big Eight Conference. Iowa State competed in the Big 12 North Division from 1996-2010, winning a share of one division title during that time. Every year, several publications release lists of their ideal "team". The athletes on these lists are referred to as All-Americans. The NCAA recognizes five All-American lists. They are the Associated Press (AP), American Football Coaches Association (AFCA), Football Writers Association of America (FWAA), Sporting News (TSN), and the Walter Camp Football Foundation (WCFF). Since the establishment of the team in 1892, Iowa State has had 16 players honored a total of 24 times as First Team All-America for their performance on the field of play. Included in these selections are 4 consensus selections, 2 of which were unanimous selections. The most recent All-American from Iowa State came after the 2011 season, when Kelechi Osemele was named First Team All-America by Sports Illustrated. In 1951, the College Football Hall of Fame opened in South Bend, Indiana. Since then, Iowa State has had two players and one former coaches inducted into the Hall of Fame. Ed Bock is widely considered the greatest offensive lineman in Iowa State history. During his 1938 senior season the team finished with a then best 7-1-1 record. At the conclusion of the season Bock became the first consensus first team All-American in ISU history. Following his football career at Iowa State Bock worked for the Monsanto Chemical Company where he eventually rose to become CEO and President. Bock was inducted into the College Football Hall of Fame in 1970. Earle Bruce is a former coach of the Iowa State Cyclones. He served as the head coach at the University of Tampa (1972), Iowa State (1973–1978), Ohio State (1979–1987), the Northern Iowa (1988), and Colorado State (1989–1992), compiling a career college football record of 154–90–2. At Iowa State, he put together a 36-32 record as well as taking Iowa State to there second and third bowl games in the history of the program. At Ohio State, Bruce was the successor to the legendary Woody Hayes, and won four Big Ten Conference titles. He was inducted into the College Football Hall of Fame as a coach in 2002. Troy Davis is considered the greatest running back in Iowa State history and one of the greatest in college football history. Troy twice earned unanimous All-American honors and was the first NCAA Division I-A running back to rush for over 2,000 yards in back-to-back seasons, a feat that has yet to be repeated. Davis finished 5th and 2nd in Heisman voting in his sophomore and junior seasons respectively. After completely his college career Davis went on to have a 10-year career in the NFL and CLF. He was a member of the Edmonton Eskimos 2005 Grey Cup championship team. Davis was inducted into the College Football Hall of Fame as a member of the class of 2016. The Heisman Trophy is awarded annually to the nation's most outstanding college football player. In 1959 after Dwiht Nichols led the Big 7 in total yardage (1,358) and points (54) he became the first player in Iowa State history to receive Heisman votes coming in 8th place overall. After his stellar 1972 campaign George Amundson became the second player in ISU history to receive Heisman votes when he finished in 7th place. In 1995 after a 23-year absence Troy Davis became the second Cyclone to gain Heisman attention when he finished 5th. Then in 1996 at the conclusion of his second consecutive 2,000 yard season Davis nearly won the Heisman but ultimately was runner-up. The Cyclones began playing football against other colleges in 1892. Iowa State has had 32 head coaches in program history. The current head coach is Matt Campbell. Iowa and Iowa State played each other 24 times between 1894 and 1934, before the Cy-Hawk Trophy was established.It was originally conceived and created as a traveling trophy by the Greater Des Moines Athletic Club in 1976, the trophy was first presented to the winner by Iowa Governor Robert D. Ray in 1977. That game was the first meeting between the two since 1934. 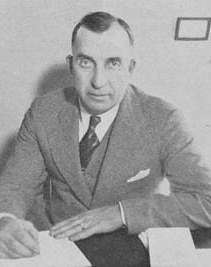 The series halted after 1934 after then University of Iowa Athletic Director and head football coach Ossie Solem would not return calls to reschedule the rivalry. Of the 64 games in the series played through 2016, 38 of them have been played in Iowa City while 26 games have been contested in Ames. Iowa currently leads the series 42-22. The teams first met in 1917, when both schools were members of the Big Eight Conference. The match-up continued as an annual conference game through the schools' shift into the Big 12 Conference. The series has been dominated by long winning streaks for both teams, with each team's longest winning streak at 10 games. Kansas State is 22–4 since 1989. Iowa State leads the series 49–46–4 all-time. Missouri and Iowa State first met in 1986 and the regional rivalry was born. Before the 1959 match-up between the two schools, which took place in Ames, Iowa, field testing showed that the telephones the two schools used to communicate with their coaches in the coaches box were wired so that either school could hear what was happening on the other sideline. The problem was fixed before the game, but neither of the two coaches knew that. Northwestern Bell Telephone Company of Ames then decided to have a trophy made to commemorate the incident, and thus the Telephone Trophy was born. Missouri leads the rivalry 61–34–9 all-time. When Missouri left the Big 12 for the SEC the rivalry was essentially ended. Jack Trice Stadium (formerly Cyclone Stadium) is a stadium in Ames, Iowa. It is primarily used for college football, and is the home field of the Iowa State University Cyclones. It opened on September 20, 1975 (with a win against Air Force), and with hillside tickets it officially has 61,500 seats. The current record for single-game attendance, 61,500, was set on September 5, 2015 when the Cyclones played Northern Iowa. In 1997, the stadium was named in honor of Jack Trice, ISU's first African American athlete and the school's first athletics-related fatality. The stadium is the only stadium in Division I-A named for an African American individual. Currently a 20.6 million dollar structure is being added to the Bergstrom Indoor Facility. This new building will house all offices, training rooms, meeting rooms, lockers (for the Cyclones) and more. Located off the north end zone of Jack Trice Stadium, The Jacobson Athletic Building currently houses all football offices, locker rooms, meeting rooms, strength and conditioning room, and sports medicine room. In addition to football, it also houses administrative and coaches offices (except men's and women's basketball). All football space (except visitors lockers) will be moved to a new Football Training facility to the west of the Jacobson Building. Space vacated will be reassigned to other sports. Clyde Williams Field (1914–1974) Martin and Eaton residence halls now stand on the ground formerly occupied by Clyde Williams Field, northwest of Friley Hall and south of State Gym. Originally, the Iowa Agricultural College (Iowa State University) teams were known as the "Cardinals". 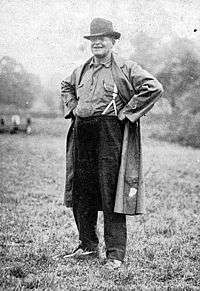 The name was changed after Sept. 29, 1895, when under legendary coach Glenn "Pop" Warner the Cardinals routed the Northwestern Wildcats, 36–0. Inspired by an extremely active tornado (then called "cyclone") season, the next day, the Chicago Tribune headline read: "Struck by a Cyclone." The article went on to say, "Northwestern might as well have tried to play football with an Iowa cyclone as with the team it met yesterday." Since then the Iowa State teams have been known as the "Cyclones". Jack Trice was Iowa State's first African-American athlete; he was also the first and only Iowa State athlete to die from injuries sustained during athletic competition. He died three days after his first game playing for Iowa State against the University of Minnesota on October 6, 1923. He suffered a broken collarbone early on, but continued to play until he was trampled by a group of Minnesota players. It is disputed whether he was trampled on purpose or if it was an accident. A statue commemorates him outside of the stadium that is named for him, Jack Trice Stadium. His legacy was forgotten until the 70's when students discovered a plaque commemorating him in State Gym. They decided to put up a petition to name the stadium, at the time known as Cyclones Stadium, after him. Originally they got the field named after him in 1984. The stadium was named Jack Trice Stadium in 1997. It is the only NCAA Division I stadium named after an African-American. The members of the Iowa State Chapter of Alpha Sigma Phi man and maintain a cannon that is discharged at home football games when the Iowa State team takes the field, following the first kickoff, the kickoff following half-time, all Iowa State kickoffs, and immediately following an Iowa State touchdown. Cy the Cardinal, Iowa State's mascot. Iowa State uses a cardinal, named Cy, as its mascot instead of an actual tornado or Cyclone. In 1954, the student pep council began the process of creating a mascot to build school spirit. As a Cyclone would be difficult to depict in a costume, a cardinal was selected from the school's official colors and original team namesake. The name of Cy was selected via a naming contest, being submitted by 17 people. Prior to the football matchup against the University of Colorado on November 12, 2005 a tornado touched down in Ames, Iowa and forced fans to either stand out in the parking lot and watch the storm or flee to shelter in Hilton Coliseum. It created such an atmosphere that Iowa State was able to win over the favored Buffaloes 30–16. When asked about the event, Colorado coach Gary Barnett said, "I thought we had a pretty good mascot. But when we showed up at Iowa State and they had a real tornado, that's the real deal." Iowa State is well regarded for tailgating. The layout of Jack Trice Stadium on a flood-plain accommodates ample parking space immediately surrounding the stadium. Cyclone fans typically arrive hours before kick-off in large SUVs and RVs to grill popular Midwestern foods such as pork loin, bratwurst, hamburgers and hot dogs. Located immediately outside and north of Jack Trice Stadium, the victory bell is rung following a Cyclone victory. 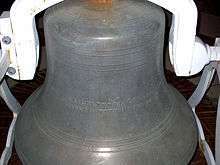 Forged in 1890 the victory bell served on campus to signal dismissal from classes before being moved to Clyde Williams Field and subsequently to Jack Trice Stadium. To go along with the installation of the new video board and sound system prior to the 2011 football season, a tornado siren is sounded after touchdowns, defensive stands, and other big plays. While the tornado siren is a new tradition, it is one that numerous Cyclones fans have asked the Iowa State athletic director to implement for many years, especially since the Colorado-Iowa State game of November 12, 2005, when a tornado touched down in Ames and sirens were heard throughout town during what normally would have been pregame activities. Since then, its implementation has become an extremely popular aspect of the Jack Trice Stadium experience. 1 2 "Big Eight Conference Football Championship History Sponsored by the Big Eight Conference (1907–1995)". Bigeightsports.com. Retrieved 2015-06-12. ↑ "History of Iowa State: Time Line, 1875-1899". Iowa State University. 2007. Retrieved 2009-04-20. ↑ Williams' Iowa State Hall of Fame bio. ↑ "Veenker Quits Michigan; Will Coach at Ames". Chicago Daily Tribune. 1931-02-26. ↑ "Veenker Quits as Grid Coach". Milwaukee Journal. 1935-11-30. ↑ "George Veenker-Hall of Fame Class of 2007". Iowa State University. ↑ "1971 Bowl Games". sports-reference.com. Retrieved 2015-12-19. ↑ Turnbull, Buck. "Walden hot after romp by Huskers." Des Moines Register. 29 Oct. 1989:D1. Print. ↑ Maly, Ron. "ISU player remember gloating Sooners in '87." Des Moines Register. 21 Oct. 1990:7D. Print. ↑ Maley, Ron. "Walden defends ISU record." Des Moines Register. 14 Sept 1994:S1. Print. ↑ Peterson, Randy. "Cyclones search for a new starter." Des Moines Register. 20 Oct. 1991:9D. Print. ↑ Peterson, Randy. "Costly 41 point loss for ISU." Des Moines Register. 20 Oct. 1991:D1. Print. ↑ Smith, Greg. "Cyclones may be surprising." Sioux City Journal. 25 Aug. 1992:D4. Print. ↑ Maly, Ron. "Panthers cut down Iowa State." Des Moines Register. 27 Sept. 1992:D1. Print. ↑ Stevens, Todd. "Cyclones shock Kansas State." Cyclone Illustrated. 8 Nov. 1993:12. Print. ↑ Maly, Ron. "Walden defends ISU record." Des Moines Register. 14 Sept. 1994:S1. Print. ↑ Witosky, Tom. "Walden's out." Des Moines Register. 4 Nov 1994:S1. Print. ↑ "Photos." Cyclone Illustrated. 7 Nov. 1994:22. Print. ↑ Krakau, Greg. "May-day aerial assault leads to K-State rout." Cyclone Illustrated. 17 Nov. 1994:18. Print. ↑ Krakau, Greg. "Cyclones defy odds; nearly topple No. 1." Cyclone Illustrated. 14 Nov. 1994:3. Print. ↑ "Big 12 Football 2011 Media guide" (pdf). Big 12 Conference. Retrieved May 17, 2013. ↑ "Chizik leaves Longhorns staff to coach Iowa State". ESPN. 2006. ↑ "Auburn to name Chizik as coach". ESPN. 2008. ↑ "Ankeny to Jack Trice Stadium". Google Maps. 2008. Retrieved 2008-12-20. ↑ "Iowa All-Time Football Coaching Leaders" (PDF). IAHSAA. 2012. Retrieved 2013-01-13. 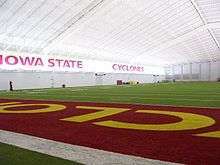 ↑ "Football: ISU's Rhoads to make $1.6 million in 2012". Ames Tribute. 2012. Retrieved 2014-08-31. ↑ "Iowa State breaks nation-worst losing streak". ESPN. 2009. Retrieved 2016-10-20. ↑ "Iowa State Claims First Big 12 Win Over Baylor". Iowa State University. 2009. Retrieved 2016-10-20. ↑ "Cyclones pull off a stunner at Nebraska". The Des Moines Register. 2009. Retrieved 2016-10-20. ↑ "Iowa State shocks No. 22 Texas with 28-21 win in Austin". Houston Chronicle. ↑ "Iowa State Upends No. 19 Texas Tech 41-7". KCRG. ↑ "Iowa State upsets No. 2 Oklahoma State in double overtime". latimes. ↑ Peterson, Randy, "Peterson: Rhoads coaching for his job after Iowa State debacle," Des Moines Register, November 21, 2015. Accessed 11-22-2015. ↑ Peterson, Randy, and Tommy Birch, "Paul Rhoads fired as Iowa State coach, will coach, will coach finale," Des Moines Register, November 22, 2015. Accessed 11-22-2015. ↑ Peterson, Randy, " Matt Campbell named Iowa State's head coach," Des Moines Register, November 29, 2015. Accessed 11-30-2015. ↑ "Iowa State AP Football Poll Summary - College Poll Archive - Historical College Football and Basketball Polls and Rankings". College Poll Archive. Retrieved 2013-04-22. ↑ "Mascot & Football Traditions"
1 2 "VIDEO: Virtual Tour Of New Football Facility". Cyclones.com. Retrieved 2015-06-12. ↑ "Jacobson Athletic Building". Cyclones.com. Retrieved 2015-06-12. 1 2 "Cyclones: the nickname". Iowa State University. 2006. Retrieved 2009-04-20. ↑ "Glenn Pop Warner". Buffalosportshallfame.com. Retrieved 2013-04-22. ↑ "Iowa State Media Guide- History" (PDF). Iowa State University. 2008. Retrieved 2015-06-12. 1 2 3 "Iowa State Traditions". Iowa State University. 2008. ↑ "Cy - Iowa State University Athletics Official Web Site - The home of Iowa State Cyclone Sports". Cyclones.com. Retrieved 2013-04-22. Wikimedia Commons has media related to Iowa State Cyclones football.